If you can't read my chalk writing, speak now or forever hold your peace. 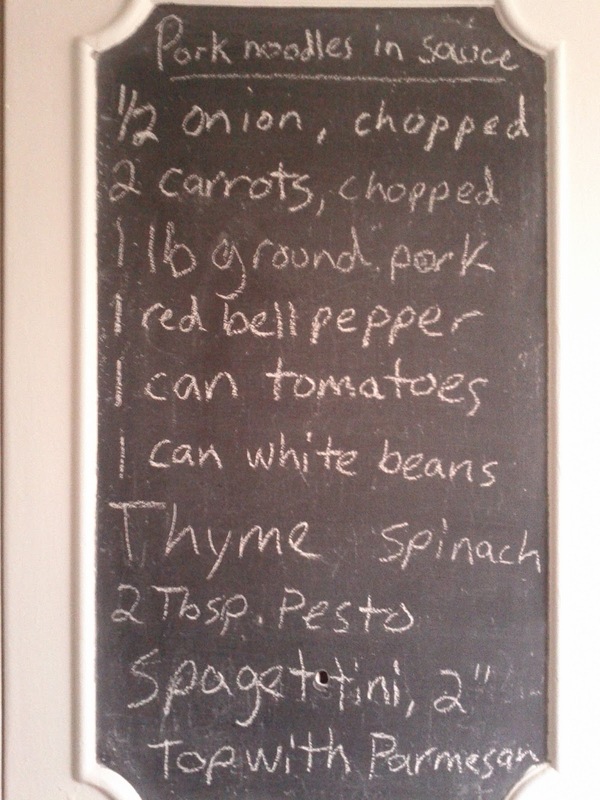 The chalkboard is how I keep track of what I use in the kitchen and methinks it is here to stay. Spelling mistakes are inevitable because it is usually written in a hurry, please ignore those. This is a one pot dish. Start by lightly browning the onion in a large non-stick wok. Mine is cast aluminum. It has no coating so I can use metal tools on it and it won't scratch. Best kitchen thing ever for a one pot dish! Add the pork once the onions start to have some colour. When pork starts to brown and is all separated into small pieces, add chopped carrots. When they get a bit tender, add tomatoes, pepper, thyme (stripped from the stem) and beans. 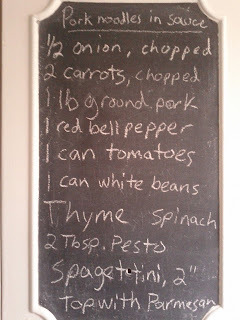 I threw in my last small handful of spinach to use it up as well. Boil whole wheat pasta until just under al dente. Add a ladle of pasta water to the sauce. Drain and add pasta. Add pesto and work it into the pasta a bit before mixing in with the rest of the sauce. When pasta is fully cooked, remove from heat and serve with freshly grated parmesan and homemade habanero hot sauce if desired. I added the beans for fibre, and while they were a bit out of place, I think they would have worked better than any other type of bean. Perhaps lentils would have been better because they are smaller and have a mild peppery flavour that would have worked. I like making these types of dishes with spaghetti or some similar pasta broken into quarter strands. It allows for easy eating, as it doesn't discard vegetables when twirled on a fork as full strands do. Sorry, no picture for this one. It disappeared pretty quickly.